On a recent record shopping expedition I picked up 'Cut the Cable', a novelty single by The Freda South Singers that served as the campaign song of the independent South Island campaign that was running in the late seventies. I recall my best friend's father being involved, in fact he may have even stood for parliament on that platform in the 1978 election. There's no info on-line about the campaign that I can find, but I do remember that their symbol was a rooster for some reason. The song itself is pretty terrible, typical of the "comedy" songs produced by radio station types (in this case Radio Avon in Christchurch). 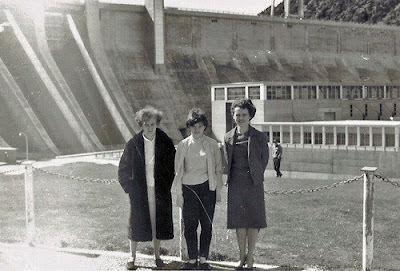 One of the arguments behind the independence campaign, and the subject of the song, was that the North Island was benefiting from the hydro-electric capacity of the South without paying it's way. The hydro-electric angle leads me to two other campaign songs. 'Damn The Dam' is probably New Zealand's most successful ever protest song. Written by John Hanlon as part of the campaign against raising lake levels at Manapouri for a hydro-electric scheme the song got to number 5 in the charts in 1973. This song gained John a bit of a reputation as a nature boy, but the truth is a little different. Hanlon actually worked in advertising and the song originated as a commission for AHI, the manufacturers of Pink Batts, who would have preferred the government focus on insulation over further electricity generation.